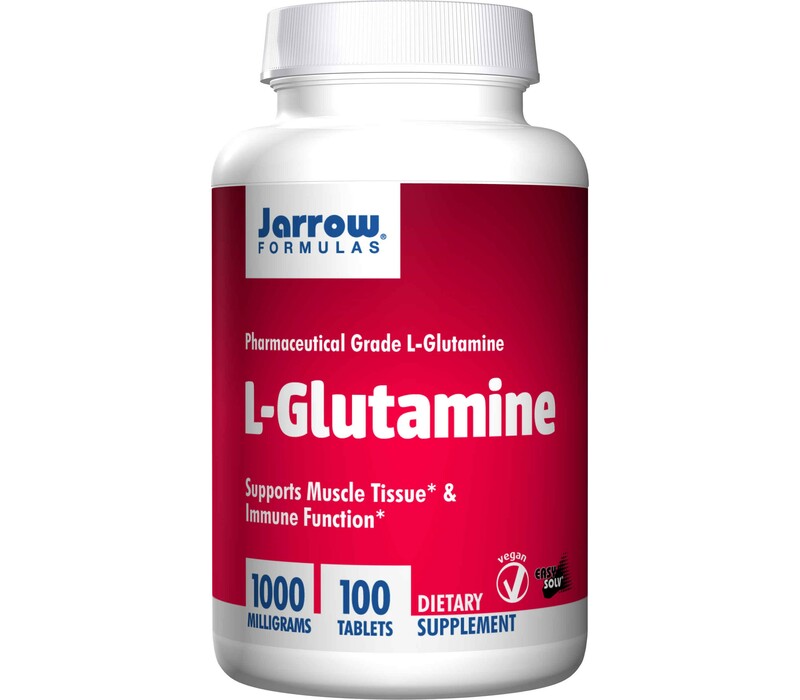 Jarrow Formulas L-Glutamine 100 tablets 1000mg contains glutamine and is widely used by people with an upset gut lining as L-glutamine helps the intestines absorb fluid and important nutrients. Glutamine is the most abundant amino acid in the human body and is involved in many metabolic processes. Skeletal muscles are the primary sites of glutamine concentration. Glutamine protects muscle tissue and supports immune function during periods of immune and muscular stress. Glutamine supplementation supports protein synthesis as well as the rate of glycogen production (by serving as a carbon donor). Glutamine is also a major source of fuel for enterocytes (intestinal cells) and supports the integrity of the intestinal lining as well as it assists in nucleotide synthesis by lymphocytes. 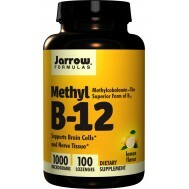 Jarrow Formulas L-Glutamine is manufactured in Japan by microbiological fermentation and is USP/FCC grade. 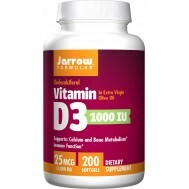 Conditionally essential nutrients are those which the body can produce in quantities sufficient to maintain health under normal circumstances, but for which the body’s needs will outstrip synthesis under various conditions. In the case of glutamine, food restriction, and other forms of physical and/or mental stress could cause the body to require more glutamine than will be available without supplementation. Under non-stressful conditions, adequate glutamine is synthesized primarily from glutamic acid, valine and isoleucine. However, stress can drop the glutamine levels in the blood as much as 30% and the levels in the muscles as much as 50%. Glutamine is used for enhancing exercise performance because it supports recovery and immune function. For similar reasons and for other explained below, it promotes the health of the gastrointestinal tract and is sometimes suggested to support and stabilize mood, for use by dieters and for alcohol withdrawal support. Glutamine is used not only in the muscles, but also in the metabolism of the immune system, the intestinal tract, the kidneys, gallbladder, pancreas and liver. Among amino acids, glutamine uniquely serves as a preferred energy source for rapidly dividing cells, such as those of the intestinal wall and the lymphatic system. 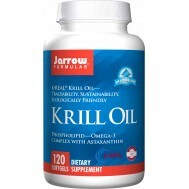 It acts as a regulator of the body’s acid-base balance ––that is, it helps to maintain the proper pH of the system –– through the production and removal of ammonia. This explains part of its importance for liver and brain health. When glutamic acid is combined with ammonia, it produces glutamine. 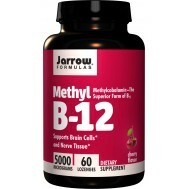 Glutamine is the an amino acid that readily passes through the blood-brain barrier. 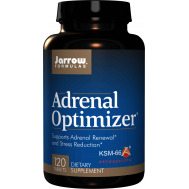 It serves as a precursor for both the stimulating neurotransmitter glutamic acid and the calming agent known as gamma-aminobutyric acid (GABA). Interestingly, glutamic acid does not cross the blood/-brain barrier. Glutamine is very important for muscle regeneration because it is a carrier of nitrogen between tissues and because it is an important precursor of nucleic acids, nucleotides, amino sugars, and proteins. A series of dose-response studies was conducted to evaluate the clinical safety, pharmacokinetics and metabolic effects of L-glutamine administered to humans. Initial studies in normal individuals evaluated the short-term response to oral loads of glutamine at doses of 0, 0.1, and 0.3 g/kg. A dose-related increase in blood glutamine occurred after oral loading and elevation of amino acids known to be end products of glutamine metabolism occurred (including alanine, citrulline, and arginine). No evidence of clinical toxicity or generation of toxic metabolites (ammonia and glutamate) was observed. Orally and intravenously glutamine seems to be well tolerated. Glutamine has been shown to be safe in doses up to 40 grams per day. Significant side effects have not been reported in clinical studies. However, mania has been reported in people with bipolar disorder and supplementation with glutamine and glutamine should not be taken by persons at risk of bipolar disorder or diagnosed with it. Take 1 to 2 tablets per day, preferably on an empty stomach or as directed by your qualified health care consultant. keep dry and closed at normal room temperature between 15 - 22°C. Do NOT refrigerate.